Looking closely at the list, you find that the mistakes that produce these regrets are all mostly errors of omission. What people didn’t do. You lose sight of your dreams, ignore your family, suppress your feelings, neglect your friends, and forget to be happy. What makes errors of omission a particularly dangerous type of mistake, is that you make them without noticing. How do you avoid the mistakes you make without noticing? By measuring your time. As I’ve said before, time is the ultimate self-improvement metric. As long as these mistakes happen without noticing, you have to be reminded not to make them. Avoiding the regret listed above requires the daily habit of 1. Planning how your time will be spent towards living your dreams, not working too much, saying what you think, cultivating friendships and being happy. 2. Analyzing how your time was spent afterwards and revise/improve your plan for the next day. A tech startup watches Daily Active Users. An eCommerce site tracks Conversion Rate. The stock market obsesses over Earnings Per Share. So what metric should we be focusing on when measuring ourselves? Whether we like it or not, time is the best indicator for what is most important to us. Time explains why we are or aren’t reaching our goals. And it’s the ultimate gauge for how dedicated we are to living in a happy and fulfilling life. But as prevalent and simple as it sounds, time is not an easy metric to keep track of. In the late nineteenth century Frederick Winslow Taylor noticed the lack attention to time in the setting of worker efficiency and as a result he strove to create the ultimate, efficient work environment. He eventually devised a system he termed scientific management. We can see our forests vanishing, our water-powers going to waste, our soil being carried by floods into the sea; and the end of our coal and our iron is in sight. But our larger wastes of human effort, which go on every day through such of our acts as are blundering, ill-directed, or inefficient, and which Mr. Roosevelt refers to as a lack of “national efficiency,” are less visible, less tangible, and are but vaguely appreciated. We can see and feel the waste of material things. Awkward, inefficient, or ill-directed movements of men, however, leave nothing visible or tangible behind them. Their appreciation calls for an act of memory, an effort of the imagination. And for this reason, even though our daily loss from this source is greater than from our waste of material things, the one has stirred us deeply, while the other has moved us but little. “Too busy” is at best a euphemism, and at worst a scapegoat. There is always time for the things you put first. But instead of focusing on what’s most important, the solution most commonly applied is to improve efficiency — striving to get smarter, better and faster by using productivity apps, lifehacks and multi-tasking. Improving efficiency is a very rational response to the feelings of busyness and unproductivity. But the solution isn’t in getting more trivial things done. The solution is measuring the amount of time we spend on the things that matter most. 437 days ago I began writing my second novel and I just self-published it this week. During those 437 days I learned a lot about how to write a novel. I’ve also come to terms with the fact that almost no one will ever read it. So I thought I would share my thoughts on being an un-read, self-taught, self-published writer with you, in case you’re working to self-publish a book or someday want to. I shouldn’t be so afraid to delete. Tracking my word count was a double-edged sword. It gave me some encouragement but it also caused me to not want to delete anything. 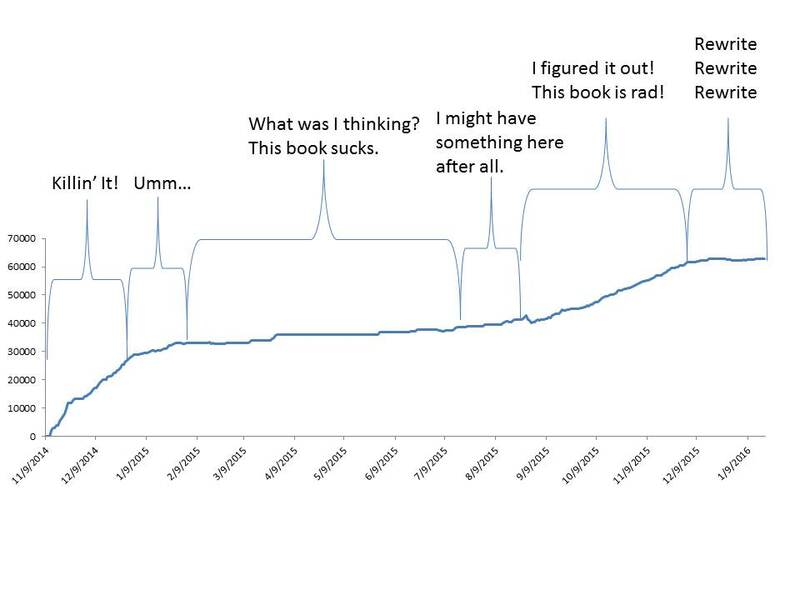 This can be seen in the data: Of the 230 days I spent adding or subtracting to the book, only 40 of them was subtracting and the average deletion was only 178 words. “All writing is rewriting,” they say and I spent way too much time looking at the screen deliberating over what to do next instead of just going forward with whatever good-enough idea I currently had—future deleting be damned. For my next book I’m going to focus less on being in control of where the story is going and instead write to understand. About three fourths of the way through I started taking those deleted paragraphs and pasting them into another document so that they would be safe somewhere in case I ever wanted to get them back. This method of humoring myself puts my mind at ease and I’ll continue to do it. Quantity of daily words is less important than the existence of daily words. Of the days I added to the book, I wrote on average 370 words. That’s a lot less than the daily number many people hold themselves to. Apparently Stephen King writes 2,000 words a day, while my single biggest contribution in a day was 2,215. For me, 370 words a day is all it takes. Instead of getting hung up on the daily total, I started to focus on the amount of time I spent writing. This suits me much better. I’ve also found that when my time limit is up, I’ll just stop, even if I’m in the middle of a sentence. This way when I sit down the next day I can pick up the momentum right where I left off. The writing skill I lack the most is the diligence to sit down and write every day. It took a total of 437 days from the first day I started writing until my book was done. Of those days I only actually wrote 230 days, 52% of the time. My longest streak was 38 days and my longest dry spell was 100 days. Based on my daily average, I could have hypothetically reached the end in 169 days instead of 437. I am convinced that sitting down to write everyday—every.single.day—is what separates pros from amateurs. The solution to get over writer’s block is a combination of #1 and #3. When you look at the trend line of my daily words you can see that by the second month of writing I’d hit a wall. I was hung up on the inciting incident of the story. I couldn’t figure out how to make it exciting enough to pull the reader in while at the same time push the protagonist forward in a believable way. Instead of writing I fiddled with outlines, fraught over the daily word count (see #1) and stopped sitting down in front of the computer (see #3). Then I did what I can only describe as act on faith—I just wrote what came to mind, knowing that it sucked, but just kept going. In the process of writing, the ideas “popped out” that helped me get over the problem I faced (I sense a metaphor for life somewhere in there). It helped that from the beginning I knew how the book would end. The new book I’ve started to write (eight thousand words in so far) doesn’t have an ending yet which makes me a little worried. The really good book I want to write someday is still inside me and between now and then I have a lot of books to write. I don’t claim that my new book is amazing and that everyone should read it. If you’re into the crime/mystery/thriller genre you might like it. From the outside-in, spending the amount of time I did on a book that stands very little chance at making any money and that few people are ever going to read (my first book that I finished a year ago has so far sold 14 copies and sits laughably at the #3,057,215th spot on Amazon’s Best Sellers Rank) doesn’t make much sense. I completely understand that (the voice in the back of my head reminds me of it all the time). I can only say that from the inside-out, to me, writing books makes a lot of sense. I think I’m going to enjoy this book more than anyone else ever will. The rationalization I use for the negative voice in my head is that ultimately my new book is a stepping stone to the really good one I’ll someday write. I adhere to the strategy of writing a great book in the same way Robert Rodriguez makes movies and Louis C.K. writes jokes. Next, Louis C. K. tells the story of spending fifteen years going no where as a comedian working and re-working the same stand-up material. Then he heard an interview with George Carlin who said his method was to record one comedy special each year. The day after Carlin was done recording, he’d throw out his material and start over. Feeling desperate, C. K. adopted Carlin’s strategy by throwing out his material and wrote something new each year. As a result he became one of the best comedians of all time. With Rodriguez and C.K in mind, I’m hasty to a fault in publishing my book. I know there’s some spelling and grammar errors that I missed but I’m okay with that. It’s easier to polish a book forever then it is to start a new one, and if it’s easy I’m not getting better. I plan to finish my third book at the end of this year (I’m going for Science Fiction this time). I’m thinking that by the time I’ve written my tenth book (slotted for release in 2024), it will be a great one. There are multiple tools out there to easily record data about yourself: steps taken in a day can be tracked with Fitbit, Mint.com will track all of your spending and Apple Watch will track your sleep. Steps, expenses and sleep could all be tracked before these tools became available but the record-keeping was time-consuming, requiring a commitment that only a very few had the patience to muster. Now, all of the data can be tracked unconsciously — and that’s the problem. The point of self-tracking is not the data, it’s the meaning; generating meaning is an activity of consciousness. A certain amount of friction is needed in the data collection process or it will be ignored and no benefit will be gained. I think paper is still the killer app in self-tracking. Automation suffers from the drawback of “out of sight, out of mind.” If you don’t give any attention to collection, you may not integrate the data into your consciousness in a meaningful way. It takes longer to write things down, which is the point. Manual collection, while more laborious, also provides opportunities for increased self-awareness. The point of taking the time to look at your credit card statement and enter the expenditures into a budget manually is to force you to come to terms with how you are spending your money. Since Mint.com does all the heavy lifting all of the automated charts it creates have little effect on curbing spending. Self-tracking tools also suffer from the double-edged sword of measurement–just because it’s easy to measure doesn’t make it important. The kinds of things that really need our attention to improve our lives are things that can’t be automatically tracked: time spent with loved ones, helping others and being a good person. But thanks to the difficulty of tracking these most important things, we’re forced to use paper — and therefore reap the benefits of conscious, manual collection. “You get what you measure.” This is great news for anyone wanting to lose weight or learn a new skill—just start measuring. Measurement provides the information needed to improve, as well as subconsciously invoking positive results. The problem with measurement is that it leads us to focus our lives on those things that are easiest to measure. And just because something is easier to measure doesn’t means it’s more important. One of the reasons people become workaholics is because measuring success in a career is so straightforward—salary, job title and promotions all make for easy measurements. Compare that with developing relationships, building a family or raising good kids. Relationships with family and friends are going to be the most important sources of happiness in our lives, yet investing time and energy into relationships doesn’t come with metrics to easily gauge your success. There are no spouse promotions or ladders to climb with your kids. 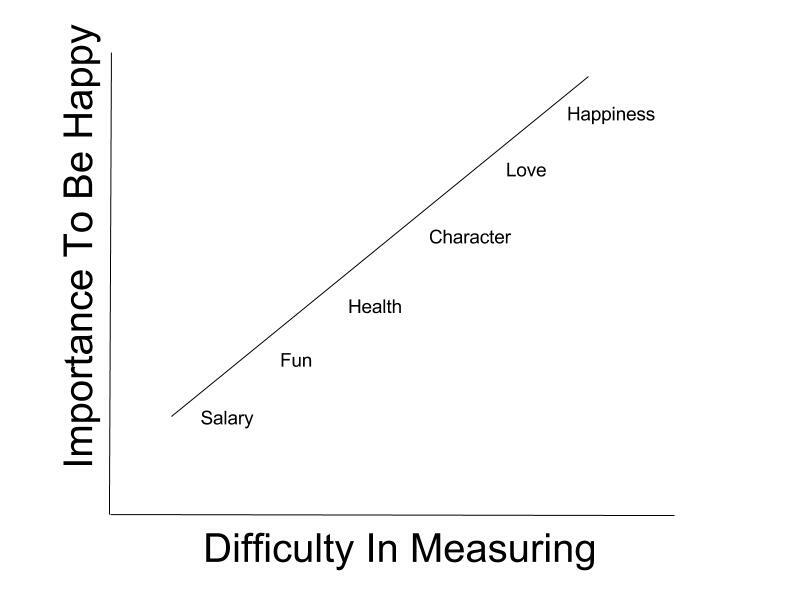 It seems to me that there is actually a correlation between how hard something is to measure and how important that thing is to be happy. The depressing part of the above chart is when you align it with where most of our time goes. We spend much more time on the things that can be measured, and ultimately less important for personal happiness . It makes sense: We are hardwired to form habits around rewarding activity. When we accomplish a goal or taste the sweet fruit of success, it’s tempting to keep pushing the same levers over and over again, investing every extra hour of time or ounce of energy in whatever activity yields the clearest and most immediate evidence that we’ve achieved something. Want To Change? Measure Yourself. Is it the data that’s collected that helps us improve or is it the mere effort of measuring that makes the difference? A 2006 study in a German hospital found that simply telling staff that their “hygienic performance” was being monitored improved hand washing by 55%. In another study, two groups of teenagers were told they would be using a new kind of toothpaste. One group were told they would be monitored, the second group were told they wouldn’t be. After three months the first group had reduced their plaque levels from 70 to 54 percent. The second group had gotten a little lazier, with plaque scores of 78 percent. The only difference was that half of the kids knew they were being monitored and the other half did not. One more example: The national weight control registry contains a database of more than 5000 individuals who have lost a significant amount of weight and manage it keep it off. Since 1994 the registry had conducted surveys of the successful losers in hopes of identify strategies that work. The most powerful factor is simply stepping on a scale. 80% of registry applicants weigh themselves at least once a week, and more than a third weigh themselves daily. And when daily scale steppers dropped off their monitoring, they began to eat more, and sure enough they started to gain the weight back. When you pay attention to your behavior you subconsciously invoke positive results simply by continuing to observe your behavior. It’s called The Hawthorne Effect: a phenomenon where individuals improve an aspect of their behavior in response to their awareness of being observed. This idea can be applied to our own lives by tracking our behavior. Want to spend more time with family, loose weight, read more books, watch less TV? Measure it. Some things appear to not be measurable. Things like love for a significant other. Presenting a number for how much you love someone would not be an easy task. But what if there was a metric that gave you an indication of how much you loved someone? Its purpose wouldn’t be to see how much you love someone compared to how much your friend loves someone else, but for the purpose of focusing on keeping whats most important top of mind (measurements tend to do that, after all). The metric for measuring love that I have in mind is one that we all have at are disposal — time. But isn’t it quality time that is most important, not quantity? In Frank Bruni’s article for The New York Times, the answer is an emphatic no. We delude ourselves when we say otherwise, when we invoke and venerate “quality time,” a shopworn phrase with a debatable promise: that we can plan instances of extraordinary candor, plot episodes of exquisite tenderness, engineer intimacy in an appointed hour…people tend not to operate on cue. At least our moods and emotions don’t. We reach out for help at odd points; we bloom at unpredictable ones. The surest way to see the brightest colors, or the darkest ones, is to be watching and waiting and ready for them. There’s simply no real substitute for physical presence. If we say that the relationships we have with others are the most important things in our lives, what would our calendars say? What would happen if we set a goal for quantity-time—the number of nights out with spouses or number of outings with kids or visits to extended family members and then tracked our progress? If this looks like a sterile way to nurture a relationship consider the more likely danger of letting time pass by while we intend to spend time with others but do nothing. This is why, Bruni says, “As soon as our beach week this summer was done, we huddled over our calendars and traded scores of emails to figure out which week next summer we could all set aside. It wasn’t easy. But it was essential. ” If you don’t consciously plan for it, it doesn’t happen. This year I watched 102 movies, almost the same as last year (103) and 174 episodes of TV – a 40% increase over last year (still 20% less than the high in 2013 of 216). Best moment: New baby boy! Most surreal: Walking in Portland’s beautiful Forest Park 10 mins from house thinking, I live here now! When you look at your site wide conversion rate, what does it tell you? What action does it inspire? What would you do differently if your site had a 1% conversion rate versus your site having a 3% conversion rate? Instead of conversion rate, how about using these metrics: Basket Rate (carts/visits), Checkout Rate ( checkouts/carts) or Checkout Conversion Rate (orders/checkouts). As opposed to conversion rate (visits/orders), each of these metrics is tied closely to specific actions that are both necessary to purchase and improvable. Marketing Optimization relates to measuring success by marketing channel – paid search, display, retargeting, affiliate, email, social and then using that information to alter the marketing investment and the marketing tactics. When you see a low conversion rate for certain marketing channels you might decide to decrease your spending in those areas or change the marketing message, placement or frequency. Or you might discover that the landing page you’re using is driving visitors to your site’s internal search and you can use that data to choose a better landing page. All of these changes happen off of the site. 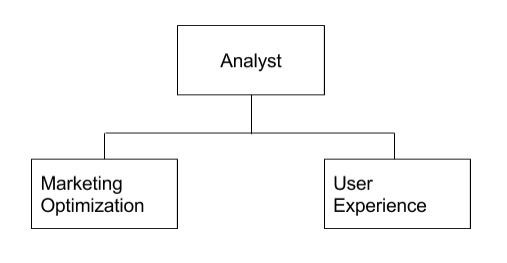 The other side of using web analytics tools is to analyze data with the intent to alter the user experience. This is where you treat each site section with a purpose and rate each site section against how well it is performing against the site’s goal of getting visitors to product detail pages > to add to cart > to checkout > to click the order submit button. Recognizing these two sides of web analytics tools is beneficial because they answer two very different questions to two very different departments: how do I improve return on investment for the marketing team and how do I improve site conversion rate for the site stakeholders. It’s easy to get them mixed up and to misalign the data you’re providing to the one’s who will benefit the most from it.